Yes, I have started this year's Kuswar preparation with a bang. 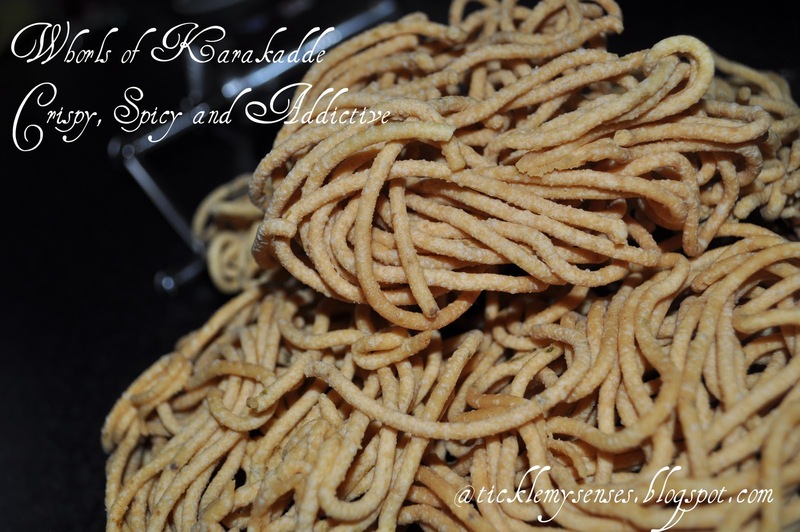 This is a very simple, yet tasty recipe for crispy, spicy and very addictive Karakadde/ Spicy gram flour sticks. 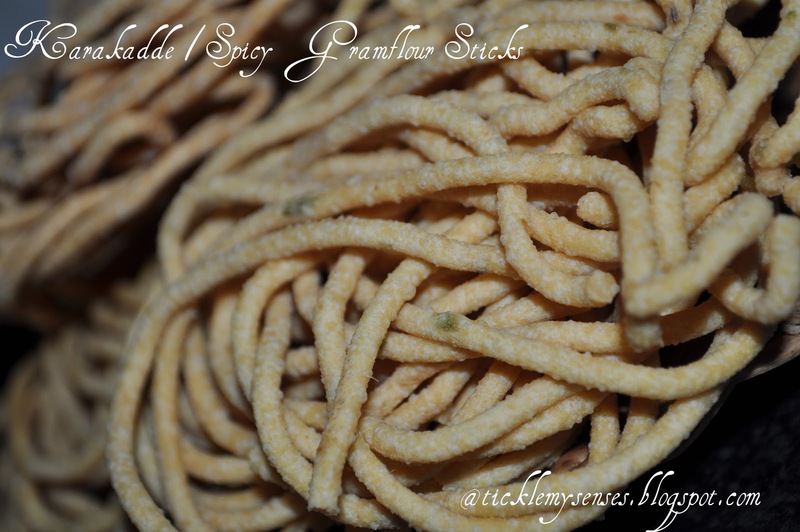 The uniqueness to this recipe is that, unlike the usual karakadde recipes that use chilli powder for the spice/ heat, this recipe uses ground green chillies and ginger, which makes it very unique and Christmassey!! Recipe Source- Adapted from Aunty Betty's recipe book. Original recipe uses 25gms cornflour and 25 gms green chilli. 1. Grind green chillies, ginger and hing to make a fine paste without water (I used a little oil from the 1/2 cup measure to make a paste in my blender). 2. Heat the remainder of the 1/2 cup oil in a pan, add the ground paste, and fry well. 3. Pour the hot fried spice paste and all the oil over the gramflour in a bowl. Wait for it to cool. 4. When cool mix well into the gramflour, add salt and water to make a soft chappatti dough. 5. Add the cornflour and ajwain/oma seeds and knead the dough well. It is okay for the dough to be sticky. 6. Divide the mixture into 5-6 balls, then pass through a karakadde maker over hot oil. 7. 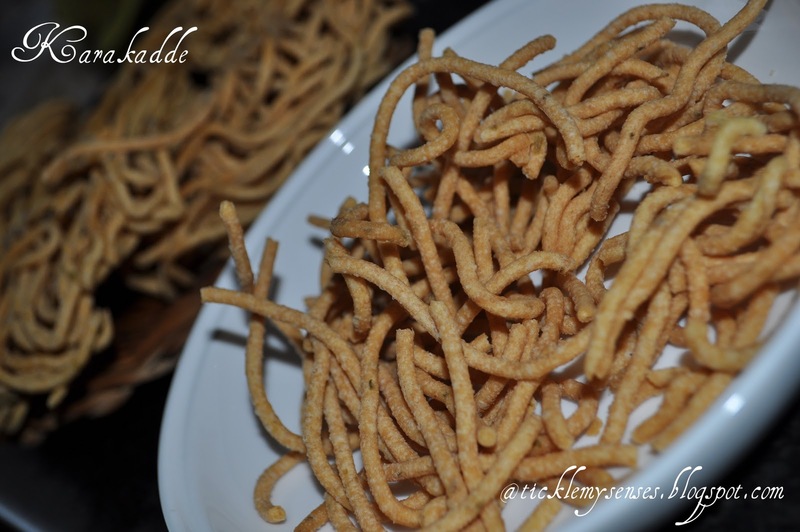 Fry till the karakadde turns a lovely golden colour. Do not overfry. Drain over tissue paper. Serve as appetizers for your Christmas party along with drinks. HI Carol, so great to visit your blog - it's wonderful! I especially love that beautiful picture of you and your son - so lovely. Thanks so much for the awards - thats so nice of you - it's always so nice to get a lovely surpise like that! wow....thats a gr8 snack...will surely love to try sometimes ! @Mary....thankyou so much for your lovely comment.